Here is yet another fine album by the Cramps. I have posted a few more albums in the past, which you will find if you use the search bar above. This collection of B-sides and rarities was seen by many as an attempt to cash in on the band's departure by I.R.S. records. This one is far from being a long player also, with "Bad Music" clocking in at only 31 minutes long. Don't let that deter you though, as each song is packed with energy and a performance that only The Cramps can deliver. The most well known song on the album is "New Kind of Kick", a song which has plenty of attitude to burn, with Interior getting lyrically rude more than once and Ivy turning in some fierce, screeching guitar. Another winner is the sleazy "Drug Train," originally the B-side to "Garbageman," which celebrates debauchery with the expected gusto. Knox gets to show his command for steady but right drumming on this one, while Interior and Ivy go crazy with the usual enthusiasm. The usual selection of covers of rockabilly and garage rarities also surfaces, most memorably with a ripping cover of Hasil Adkins' "She Said." More semi-hits like "Human Fly" and "Goo Goo Muck" surface as well, making the whole release a fine if overly short overview of the Cramps' vision. Production at points ventures into the totally primitive, which is all the more appropriate for the band in question, admittedly giving everything the necessarily rough-and-ready atmosphere for the group's own brand of scummy sleaze. The artwork is notable in its own right, with the fleshless big-haired ghoul on the cover having turned into an icon for the Cramps and psychobilly music worldwide. Edit: I re-uploaded this as requested. I also increased the bitrate to 320kbps. Enjoy! Igor Wakhévitch (born May 12, 1948, Provence, France), son of the art director Georges Wakhévitch, is an avant-garde French composer who released a series of studio albums in the 1970s and composed the music for the Salvador Dalí opera Être Dieu. He was a contemporary of similar avant-garde electronic composers, such as Pierre Henry, who was also born and based in Paris. Although Wakhévitch is a relatively unknown composer, he gained a small cult following in the late 1990s after praise circulated by Nurse with Wound (on the list of influences in their first album, from 1979), Michael Gira of Swans and a review of one of his studio albums by Dominique Leone for a feature entitled "It Was the Strangest Record I Had Ever Heard" on Pitchfork Media. From the age of eight, Wakhévitch learned to play piano under the tutelage of Louise Clavius-Marius and Lucette Descaves. Between the ages of 12 to 17, he studied at the Conservatoire de Paris. During this time, he was auditioned by Herbert von Karajan for a concert at the Théâtre des Champs-Élysées, and in 1965 he won the Jury's First Prize for Piano by a unanimous vote. In 1967, studying under Olivier Messiaen, Wakhévitch won the first prize in Musical Analysis. In 1968, he worked for the GRM in the Office de Radiodiffusion-Télévision Française, under the direction of Pierre Schaeffer. This is the most obscure album of the lot. I’d never hit it before this release. Aptly in tune with the title, it is also one of the strangest. Docteur Faust was created for a festival in Avignon, and was later choreographed. Though, the mind boggles as to how anyone could dance to this. “Full of fury and energy” to quote a reviewer at the Avignon festival, it certainly is! On one hand this is a more balanced blending of classical and dramatic musics, yet also it is much more extreme. There’s a wealth of sonic collage, dense musique-concrète, and bizarre musics that collide and fragment against rock structures. There’s also moments of pure classical avant-garde moving into ensemble pieces feeling like Henze meets Ligeti or Xenakis. The use of electronics is really vivid too. There are no rules or boundaries in what makes up a Wakhévitch composition! The rock elements return throughout this album and, although not credited, I would guess that again Triangle members are featured. The guitar reminds of Alain Renaud, and percussion is quite distinctive, backed-up with weirdly treated organ. Although a short album, it is so engrossing and weird that it would be too-much if it were much longer. 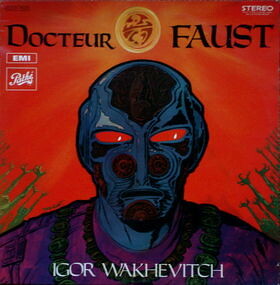 On Docteur Faust you will hear a very eclectic approach to music. Strange electronic effects, choir-like vocal arrangements, snippets of orchestral music, and rock music are combined with fragments of musique-concrete like the voice of (most likely) the pope, and on top the sound of a whip, a spoken voice reciting over weird electronic sounds, gun fire, a neighing horse, etc. Edit: I just realized how low the bitrate is on this album. I realize 128kbps isn't good enough for many of you, so I will try my best to replace this with a higher quality rip soon. Edit 2: The album with the improved bitrate is now up. Thank you for your patience.